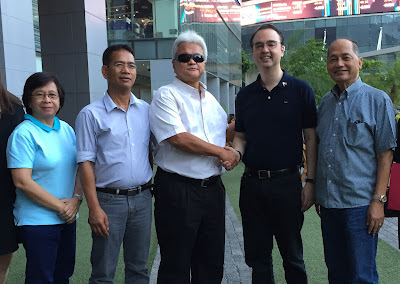 Department of Foreign Affairs (DFA) Secretary Alan Peter Cayetano, Chairman of the 10th ASEAN Para Games, starts preparations for the 10th ASEAN Para Games in Manila with the Philippine Paralympic Committee (PPC) and the support of the Philippine Sports Commission (PSC). The Games will be participated in by 11 countries competing in 20 sports composed of 400 events. The estimated attendance is around 2,000 para athletes, 1,000 team officials, 1,500 technical officials and 100 medical staff. A total of 4,000 local volunteers will be mobilized to assist in the staging of the games. Above, Secretary Cayetano shakes hands with PPC President Mike Barredo in the presence of (L-R) PPC Marketing Director Debbie Tolentino, Philippine Sports Commission (PSC) Commissioner Arnold Agustin and PPC Vice President Tom Carrasco Jr. This is the second time that the Philippines is hosting the biennial event after its 3rd edition in 2005.